Hello, frugalistas. 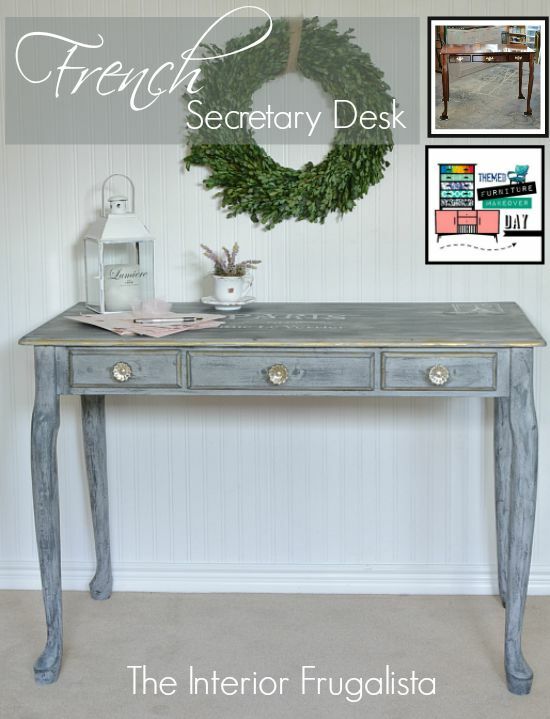 Normally I would be sharing a Frugal Decor Tuesday project with you today but I have another exciting event to share. A new series has started in the blogosphere featuring seasoned bloggers in the 50+ age group. It's called Between The Lines: A Look Into The Lives of Bloggers Over The Age of 50 and I certainly quality at the ripe young age of 57. 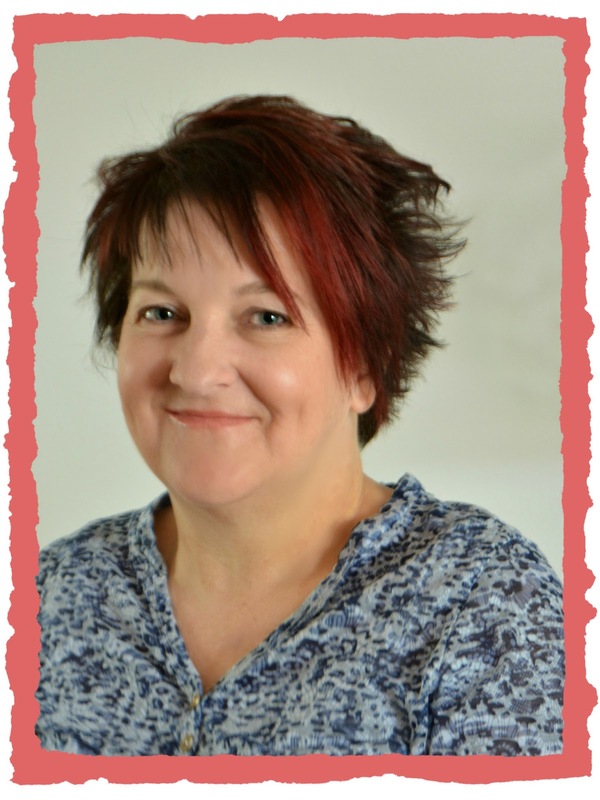 I am honored that Katherine, the mastermind behind this series, has chosen me as one of the ten featured bloggers to launch this series. Every Tuesday for the next ten weeks, 10 bloggers will be interviewed and featured at Katherine's Corner. On the 11th week, the tables are turned when the participants interview Katherine! Why did I start blogging in the second half of life? When Mr. Frugalista and I purchased our 60's fixer-upper, we began the process of making it our own on a very tight budget. 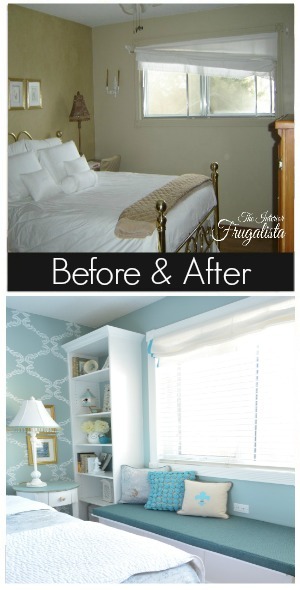 With a lot of DIY elbow grease, thrift shopping, repurposing, and creativity we spent almost a decade renovating our home one room at a time. Visitors would comment on our DIY savvy skills and often called to see how our progress was going. Then a couple of years after closing my real estate home staging business, I was itching to get my creative juices flowing again. 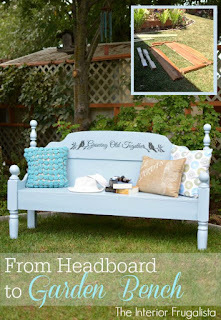 That is when I stumbled across a furniture upcycling course using milk paint. The clouds parted and angels began to sing - I found my calling! I started thinking about how I could share our home renovations and my furniture projects online with family and friends. I knew absolutely nothing about blogging and social media was something the young'ns were all caught up in. 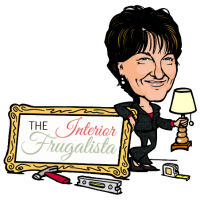 One night in a dream the name The Interior Frugalista came to me. I woke up, grabbed a coffee, went to my laptop and found Blogger, a free blogging platform, and the rest is history! Naivety is bliss because had I known then what I know now about blogging, I would have run the opposite direction with my tail between my legs. I am living proof that you CAN teach an old dog new tricks! We turned our 80's Wall Unit into a Built-In Fireplace Feature for our living room. 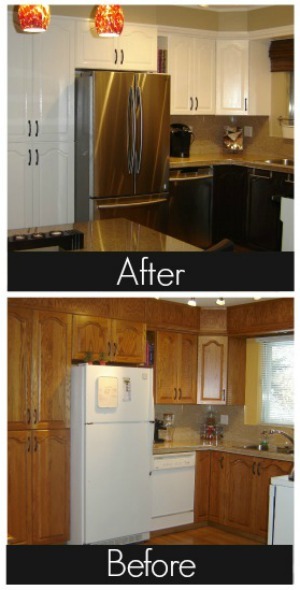 We lightened and brightened our kitchen because quite frankly, it felt like we were living inside a wooden box. Our almost twenty-year-old appliances needed replacing and so we decided it was a good time to tackle this room. When we replaced our bedroom window with a much larger one (a huge splurge for us), we built a custom window seat and bookcase surround. 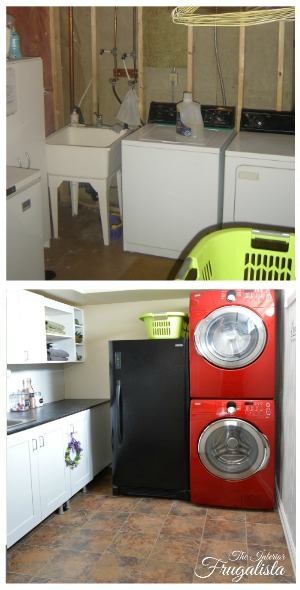 Another room I was thrilled to finally tackle was our basement laundry room. We got the new appliances at the same time we replaced the kitchen ones - a huge but necessary splurge. Like I mentioned above, I found my furniture upcycling calling well into my 50's. I get so much joy rescuing furniture and breathing new life into each piece. It also gives me great satisfaction knowing that I may have saved another piece from the landfill. 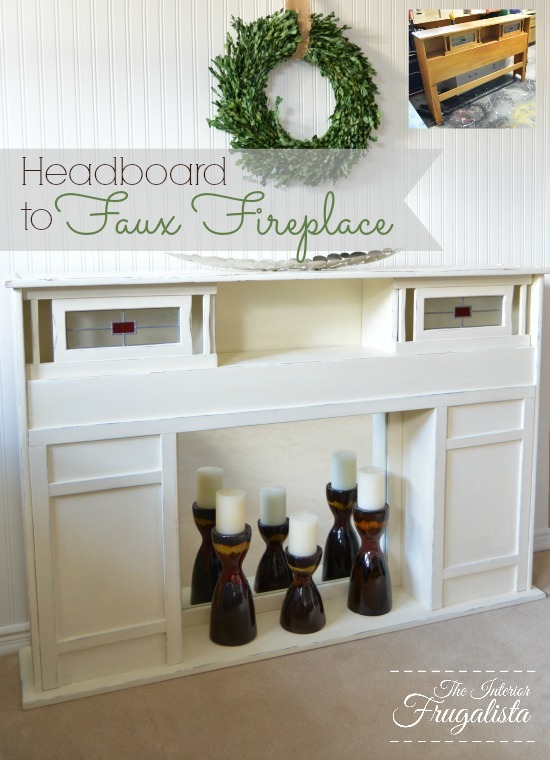 Like this 50's headboard that Mr. Frugalista and I transformed into a Faux Fireplace. Or this headboard and footboard that a rodent used as an all you can eat buffet during the winter in our shed before I transformed it into a Garden Bench For Two. 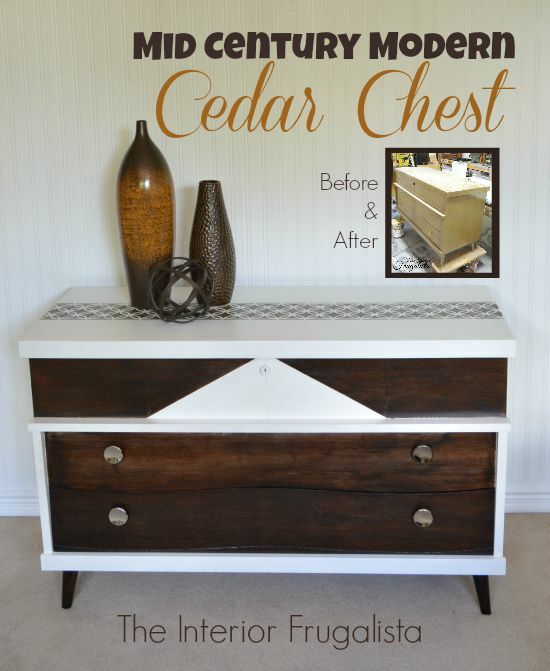 Or this fabulous Mid Century Modern cedar lined chest. 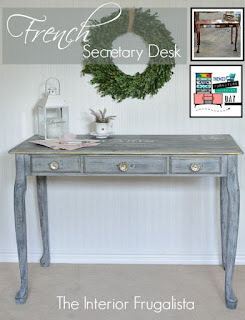 One of my favorite furniture makeovers was a writing desk that I transformed into a French Envelope (take a close look at the top of the desk). According to my blog statistics, a large number of you, my loyal frugalistas, are in the 50+ range so this new series is a great way for you to meet other bloggers in the Nifty 50's Club. Say hello and tell her that Marie sent you! If you like what you see when visiting the other bloggers featured in this series, subscribe and/or follow them on social media. I hope you follow the series for the full 11-week duration. 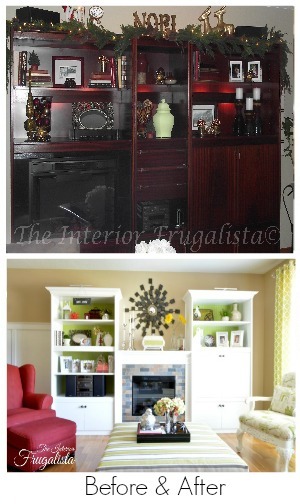 I'll remind you each week on Frugal Decor Tuesdays.